This is the month for hardcane dendrobes and a very pink month it is, too. The rainy season is not over yet, and the danger of flowers aborting and new growths rotting during dull days remains a concern. 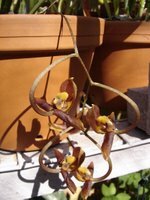 I have noticed some cymbidiums already pushing up their primeval-looking flower spikes out of the bark in their pots. Maybe a bit early, but the coolish weather must certainly be to blame. 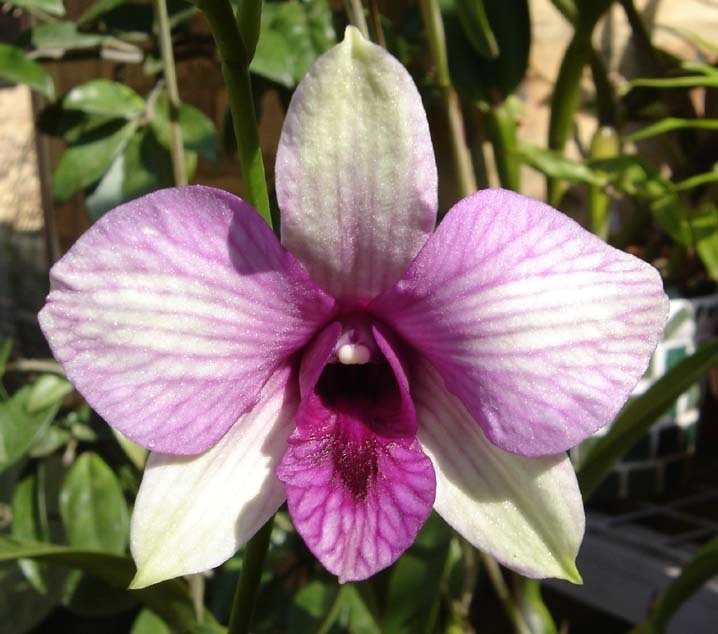 Dendrobium bigibbum var. compactum. This plant is an amazingly rewarding one to grow. Compact, as the name suggests, and exploding with magenta flowers with iridescent lips. Quite inviting. My specimen actually fell off its perch on the staging in my greenhouse, top heavy with all the blooms facing towards the light. Even after such a shock, none of the flowers were lost and it is quite a display in the living room. Dendrobium Pramote Mutation. That's the name on the tag, anyway. I can't really tell whether it is meant to read Promote Mutation, or whether it is some sort of reference to the Motes nursery (which I doubt). Illegible tags and nameless plants are always a nuisance; no matter how beautiful they are, some of the romance is lost to me. Epidendrum ciliare. According to the literature, the plants are often mistaken for white-flowering cattleyas when out of bloom. 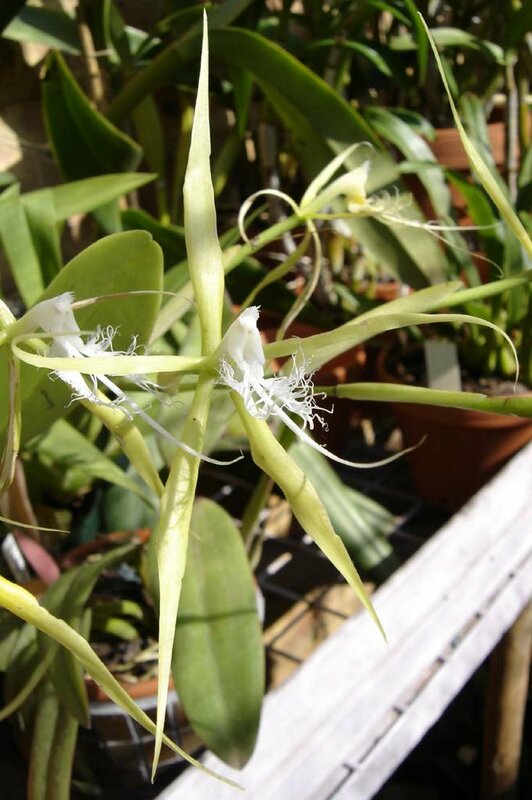 This is an awesome epi to grow, with enormous, spidery green flowers with complicated artifacts on the labellum. I love it. Snails love it, too. 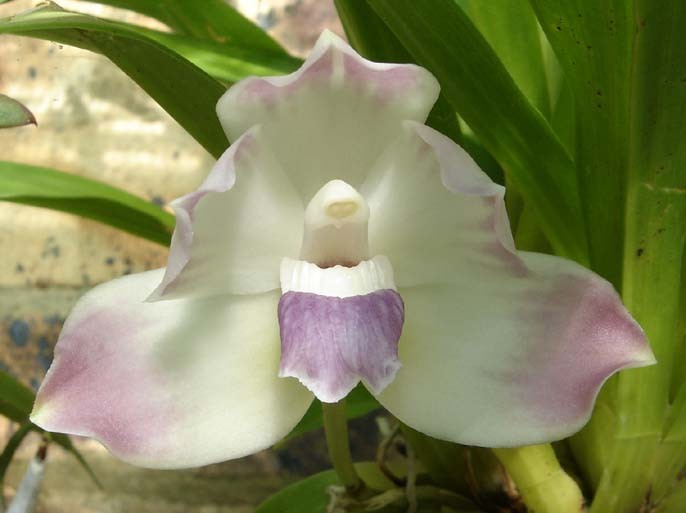 Dendrobium (Midnight Velvet x Lipstick). 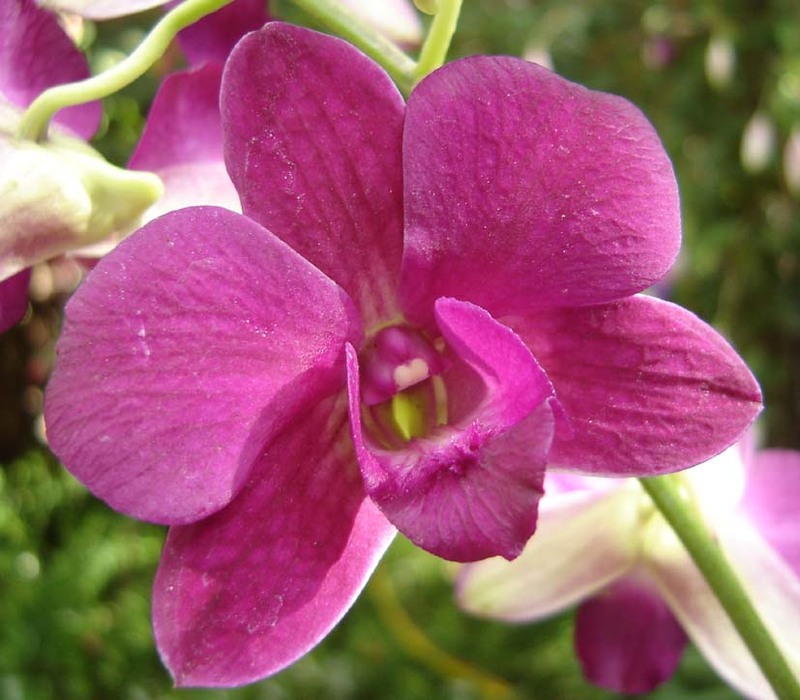 An orchid straight out of a Thai bordello. Intense colour, large flowers and impressive flower count, this is a cross with lots of charisma. I have seen some of the other... uhm, "litter mates" from this grex and there is some variation in the fullness of the flowers as well as the intensity of the red pigment. The one pictured here is definitely awardable, if you ask me. Pescatorea wallisii. A breathtaking species from an underrated genus in the Zygopetalinae tribe. This leafy plant comes from cloud forest in western Ecuador, doesn't have any pseudobulbs and produces fragrant flowers carried singly on inflorescences emerging from the newest mature growth. 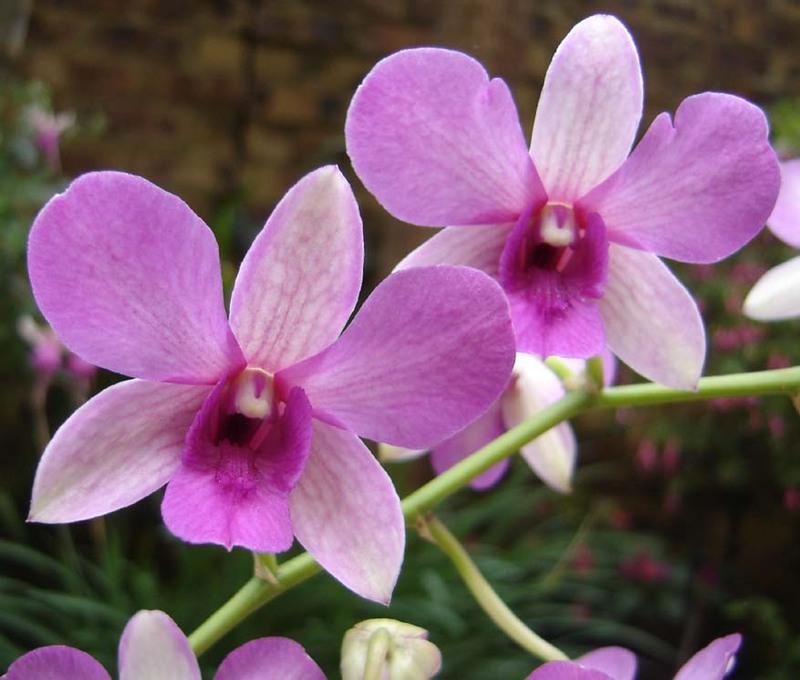 Dendrobium Genting Pink. Another case of mistrusting name tags from Asian nurseries. I always assumed Genting was Engrish for the dye gentian (I also have a plant called Den. Genting Blue), until I discovered that Genting is a city in Malaysia! Gongora galeata. 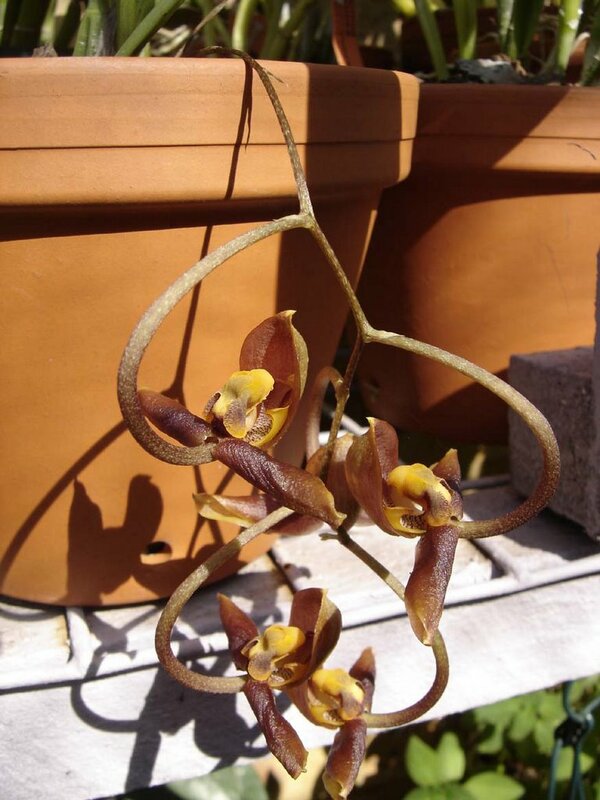 A delightful Mexican species with curiously twisted flowers emerging from a pendant inflorescence. The plant is related to Stanhopea and its rich brown insectoid flowers make for an interesting sight hanging below its ribbed pseudobulbs. Isn't nature just so weird and wonderful? 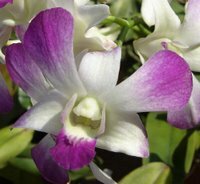 Dendrobium Pak Bung. I received this plant as a hand-me-down from a friend. It subsequently produced a number of large flowers with pink candy stripes on a light green background. A hypnotic hybrid with a bold labellum, I dare you not to like it. Really pretty. Have you seen Adaptation? I love Adaptation! A lot of people didn't get the point of it, though. It bears virtually no relation to the Susan Orlean book and is more a study of Hollywood and how any truly original screenplay has to "adapt" to survive. The way the movie starts of as something unique and strange and ends up being cliche-ridden (drugs, car chases, brother bonding, getting the girl in the end, people being eaten by 'gators etc.) is supposed to be ironic. And yet a lot of my friends said that "the movie was really boring until the last third"! Oh, well. Maybe Charlie Kaufman isn't for everyone. For the rest of us: we deserve more convoluted, self-referential, intelligent films like this one. 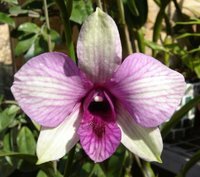 For some interesting books seemingly about orchids, but actually about insane people, try The Cloud Garden by Tom Hart Dyke and Paul Winder: a true account of their expedition to the Darién Gap on the border between Panama and Colombia. What started of as an orchid hunting expedition turned into a nightmare when they were captured by FARC guerillas and held for ransom in the jungle for nine months. Also try Orchid Fever by Eric Hansen, a book about the cutthroat and often violent world of orchid conservation. Thank you, will try to check them out some time. I also really enjoyed Adaptation!